Breast cancer is the first cancer among women, both in the US and Europe and current treatments for metastatic breast cancer (MBC) combine biopsy, chemio-, radio- and hormono-therapies. But biopsies are not always possible, on all tumors, which is a key concern for MBC. Thus, a comprehensive quantification of receptors as well as the characterization of all hormono-dependant cancer expressing receptors are not possible with biopsies. 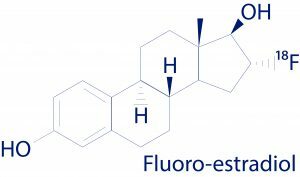 EstroTep is a PET imaging radiopharmaceutical authorized in France capable of characterizing metastatic lesions, known or suspected, as expressing estrogen receptors in adult breast cancer, initially expressing the estrogen receptor, as per French Marketing Authorization. EstroTep targets REα Receptors. As a complement to biopsy, EstroTep imaging allows a comprehensive quantification of receptors as well as the caracterization of all hormono-dependant receptors.EstroTep allows a whole body and non-invasive metabolic imaging, to visualize disseminated ER (+) tumors, especially in non-accessible areas.